I headed to the Dryden Theater at George Eastman House (900 East Ave.) to see Hearts and Minds. I really wasn't prepared for it at all. I watched in horror as the war in Iraq played out before me. I mean, if someone were to take the footage from this film, edit it together exactly the same way and release it today, people would definitely complain that it tries to make Iraq look like Vietnam. The only trouble is, this was made in 1974 as a postmortem documentation of the Vietnam War. Fabricate a "threat" to America. Identify a place where a quasi-rational claim can be made that the area is imminently threatened. Be sure to pick one where the language and culture are very different from English-speaking, Christian Americans. Declare war on the "threat" and engage in combat in the selected area. Align all dissent with support of the "threat". Any disagreement with the position of the military and its hopeful outlook is "dissent". Declare the enemy to be less-than-human. Make claims that the enemy does not respect life which gives them a tactical advantage. Continuously claim that great progress is being made. Produce no undisputed facts. Attempt to fine-tune military tactics and technology in an attempt to defeat an enemy who will never stop trying to defend their homeland against an enemy invader. Ponder whether America chose the right allies and neglect that America's actions are the wrong side. Establish a "democratically elected" government — one that specifically supports the United States policies. Remove any government or authorities who disagree with U.S. policy. Support troops that align under the new government and migrate military control of the region to them. Disengage U.S. military involvement in the region. Make claims ex post facto that all success was as a direct result of action taken, and certainly not a result of the United States leaving the region. In Vietnam the "threat" was Communism — a holdover from the 1950's and even called the "Red Threat". People were (and are) taught that Communism is a threat to freedom. In reality it competes with Capitalism as an economic system, but no more a threat to freedom than Capitalism is. The theory is (see above) that Communists are less than human — they act like hornets: their individuality is crushed by the goals of the collective so much that they don't even fear death. They use lies and any immoral tactic necessary to recruit new members. In Iraq, the "threat" is terrorism. We're taught that terrorism is a threat to freedom. In reality, the tactics to stop terrorism are the threat to freedom: undocumented police searches, torture, secret arrests, and the suppression of free speech. The theory is (see above) that terrorists are less than human — they act like hornets: their individuality is crushed by the goals of the collective so much that they don't even fear death. They use lies and any immoral tactic necessary to recruit new members. So I started theorizing on what goes wrong — how did we get here again? I think the crux of it is that we supposedly have a representative government but that representation has failed. We expect our representatives to listen to the will of the people and to lead based on that will. We expect our leaders to find solutions that make everyone happy — to unify these United States rather than to divide them. I spent the better part of my free time trying to develop a graph to represent the whole thing, mostly erroneously trying to represent population in some proportional way and also to present the data in a logarithmic fashion. But the gist is this: assuming that people are free to organize in protest of the government, the measure of "good leadership" is that few people choose to organize in protest. The numbers in parentheses represent a population based on 300 million people — approximately the population of the United States in 2007. The goal of leadership should be to keep the percentage of people actively protesting as low as possible, and divided in support/opposition of an issue as balanced as possible. The ideal is zero, but if that cannot be attained, then equal numbers on either side should be the goal. This is represented by the outer ring with green toward the bottom "zero" point and orange indicating a problem. The inner colored ring indicates likely types of problems. 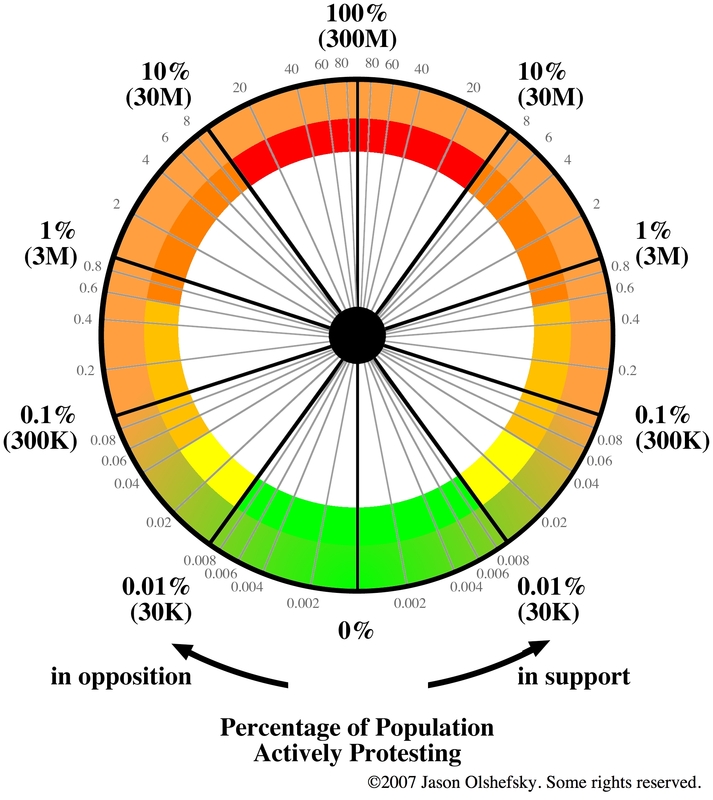 The yellow area between 0.01% and 0.04% is a danger zone for a politician, for between 0.04% and 0.6% is when their approval ratings will begin to drop. Between 0.6% and 10% is an increasing risk of revolution (in the case of activity on one side of an issue) or civil war (in the case that both sides are equally ired.) 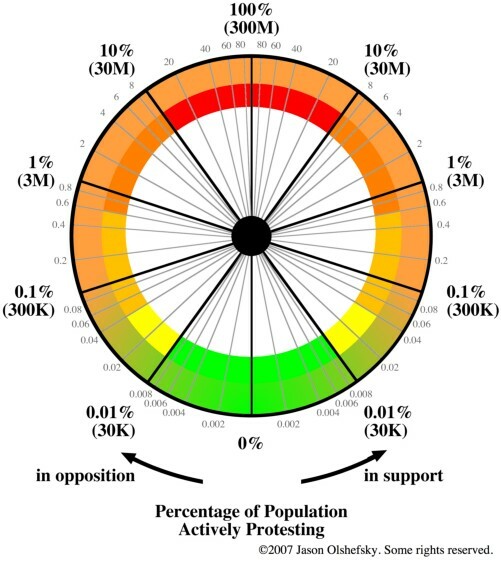 The red area above 10% pretty much guarantees violence. Let me qualify this that it's just speculation. I'm no expert in politics or leadership. I was just picking numbers out that "sounded good." However, the I feel the underlying theory is valid: that the goal of leadership should be to minimize the need for protest. And that's something else that I should reiterate: this chart is about the number of people actively protesting — that is, picket-signs in hand, involved in a march or other form of public dissent. Now there's three cases that a leader will typically be looking at: virtually no protest, protest that is lopsided, and protest that is strong but balanced. If there is little protest, then that's a sign of a "good job" and the leader should look to fix other more controversial issues. In the case of a lopsided protest — where there is a significant population that is protesting one side but very few on the other side — then there are several possibilities. One is that the protesting side is vehement about one facet of the issue, and in that case, the leader should have the wherewithal to re-frame to defuse its antagonistic component. Another is that the leadership is not representing the will of the people — and in that case, the leader should adjust their position and policies to be more accommodating of the protesters. In the case of a balanced, strong protest, it's the leader's role to act as diplomat. They should consider whether another option — outside the spectrum of the opposing poles — could resolve strife. If they are unable to accomplish that, then there is the likelihood of bloodshed and the possibility of full-blown civil war. So back to Iraq — if I recall correctly, protests against the war — the largest protests — are in the range of 200,000 to 500,000 people. In that range, we're talking about 0.08% to 0.2% of the population. I am not aware of protests to support the war although there are typically a small number of protesters against the anti-war movement — a bit derivative, but (again, if I recall correctly) typically a small number. Perhaps 2,000 to 10,000 at most — 0.001% to 0.004% or so. In this case, I think it's the responsibility of our leadership to either (a) re-frame the war to make it amenable to anti-war protests or (b) to change policy to balance opposing factions. It's clear that their efforts are squarely in re-framing the war: that it's a war for freedom, or peace, or against terrorism — but the anti-war movement is not buying into it. This opposition is simply against the war. And in that case, the move should be to get out of it. So then, imagine more generally if we actually had balanced leadership. Imagine if people had to protest in the streets to favor a war rather than to protest only to oppose it. Imagine if our country believed in peace so much that our leaders insisted that the people ordered them to start a war. Imagine if war was not the default action but the exceptional action — a complete reversal of our current policies. But then again, what do I know about leadership? I can't understand why anyone would resort to war when diplomacy and peace are alternatives. I guess I can't stop believing in the ideal of "good leadership" — where the seemingly miraculous solution that appeals to everyone is commonplace and war is seen as the pathetic, stupid cop-out that it is.